My daughter and I are semi-vegetarians; my friend, who has the same diet, likes to call us flexitarians. We don’t eat meat whenever we can avoid it, but if it’s there—say, for a holiday meal—we eat it. Sometimes, however, my daughter will ask for chicken from the store, and I will buy it. My husband, the family cook, is also a meat eater, and when he chooses to cook meat, we usually eat it. We have a small budget for food and can’t cater to multiple diets. That said, we feel more and more concerned as we get older, and I think my daughter is old enough to consider more information about vegetarianism. I was a vegetarian for years before I became pregnant, and my goal was to return to the lifestyle when I felt it was appropriate. 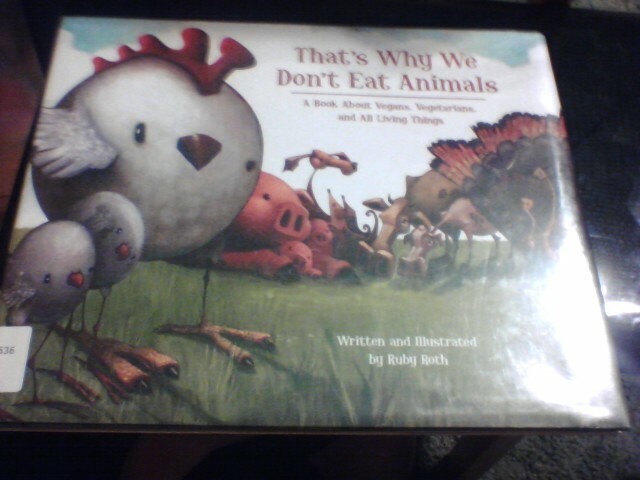 So I checked out the book That’s Why We Don’t Eat Animals: A Book About Vegans, Vegetarians, and All Living Things by Ruby Roth from the library. I haven’t read it to her just yet because I’m not sure that I want to. The illustrations are mostly adorable, and the content is mostly useful… but it’s quite long. Some pages are filled with text, which my daughter might not be able to sit through just yet. But more than that, I am concerned about a couple of the illustrations themselves. They aren’t really bloody, but they are grainy and gritty, with the implication of violence and perhaps blood. While this is something that I think is important for most people to see eventually, I don’t find it appropriate for a picture book for little kids. There is really nothing in the book to keep kids hooked. Some sweet animal situations, like pigs cuddling, are mentioned, but not with the stick-with-you-ness that should be there. It’s told in a more clinical voice, and I wish it were just a bit more subdued to help kids really connect with the animals. That said, I think kids around the age of nine or so might with the book—just not the younger crowd. I think a rhyming book, or simply a book with a bit less text, would be more helpful for what I’m looking for. Most of the illustrations do work, and I really like the connections made with the rainforest and endangered animals. I do like this book, though, and might check it out another time in the future.